Pioneers in the industry, we offer safety harness, karam safety belt, safety net, maintenance & window-cleaning kit, fall protection devices and full body safety belt from India. 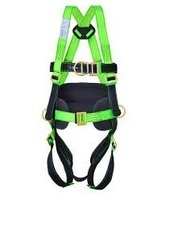 We are manufacturer and dealers of different safety harness products . A safety harness is a form of productive equipments designed to protect a person, animal, or a object from injury and damage. 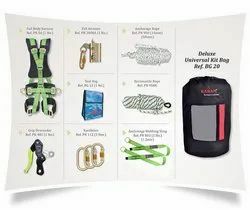 The harness is an attachment between a stationary and non stationary and is usually fabricated from rope, cable or webbing and locking hardware. Comes with two front attachment textile loops in addition to the forged aluminium dorsal D-Ring for fall arrest. Adjustable chest, shoulder and thigh-straps. We are a reputed organization that is engaged in provide Safety Net. All these shade nets are used for construction and buildings. Also, our range is used to protect buildings. Ideal for the fall prevention & debris prevention in construction industries. 185 RS PER METER . This Kit is meant to fulfill all the purposes and requirements of personnel engaged in maintenance jobs at height. 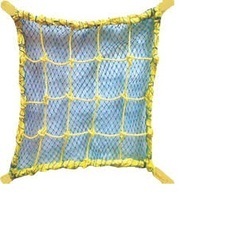 Provides ultimate comfort level to a personnel working at height thereby fulfilling all his needs. The specialized rescue equipment used i this kit enables immediate rescue of personnel when suspended at a height after suffering a fall. Comes with Easy Back Packable Carrying bag. Different lengths of ropes available as per the requirement. We are manufacturer and dealers of various fall protection equipments which are confined psace products. Rescue and decent products. Temporary fall protection lifeline system.Personal Fall Protection.Equipment Servicing. With our rich industrial experience, we are actively engaged in offering Fall Protection Accessories such as Full Body Safety Belt. Provide comfort and confidence, and directly affects the user's productivity, as well as gives them flexibility to do what needs to be done on the job site. We are highly engaged in fall protection kit which releive the fear of working atop a roof and other high surfaces . 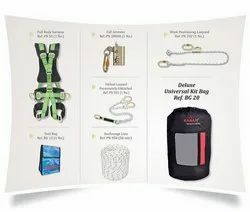 Safety fall protection kits include required all arrest system components. 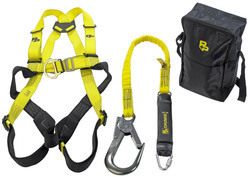 Our fall protection system are legendary for their comfort, ease of use, and relaibility .The Safety Works Workman Fall Protection Kit features a standard size, vest-style harness, a temporary roof anchor, a 25 ft. rope with a manual rope grab and a lanyard, all in a convenient 5-gallon bucket with a lid for easy transportation. 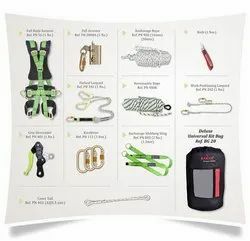 Kit includes Workman Quick-Fit standard size vest-style harness, a temporary roof anchor, a poly-steel 25 ft. rope and an integral lanyard and rope grab. If you work in construction or maintenance, your workplace may require you or your employees to work at heights every now and then, if not regularly. If that's the case for you, it's important that you know the rules and your rights. Baseline's working at heights training will help you quickly develop that knowledge.t's an explicit requirement of current legislation that workers must not be placed at risk at any time throughout the course of their work. As a result, there are many safety regulations you need to be aware of and stay up to date with.In situations where a worker is at risk of falling from one level to another and reasonably likely to injure themselves or someone else as a result, a Person Conducting a Business or Undertaking must take reasonable steps to mitigate the risk of working at heights.Take any of our working at heights training courses to get a full grasp of how these regulations work, and how they play out practically. Immediate Rescue equipment contained in the Kit enables immediate rescue of a personnel when suspended at height after suffering a fall. 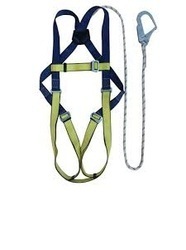 Tower Kit is designed for the personnel engaged in working on high rise tower with an extra facility of bigger Hooks & easily adjustable Lanyards to suit the requirement of the working individual. Confirms to all relevant CE norms.